Phaethon sought assurance from his mother that his father was Apollo the sun god. She gave him the requested assurance and told him to turn to his father for confirmation. He asked Apollo for some proof that would demonstrate his relationship with the sun. When the god promised to grant him whatever he wanted, he insisted on being allowed to drive the sun chariot for a day. Placed in charge of the chariot, he was unable to control the horses. The earth was in danger of being burnt up and, to prevent this disaster, Zeus killed him with a thunderbolt. 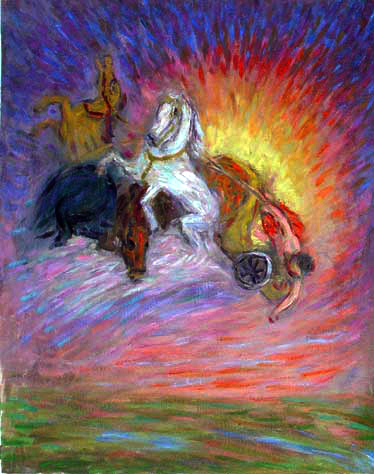 Here, Phaeton has been struck by the thunderbolt, the horses and the chariot are flipping over as Phaeton falls to earth.